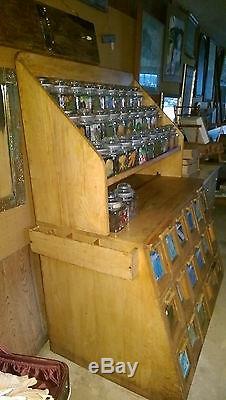 Seed Bin Cabinet with Canister Shelf Display Top. 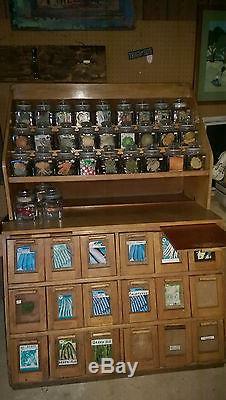 This incredible 1920's Seed Display Cabinet is in amazing condition for its age. This came from a Country store named. "Cohick's Trading Post" Cohick's was opened in 1924 and was opened for 91 years. It is quite large and comes in two parts. 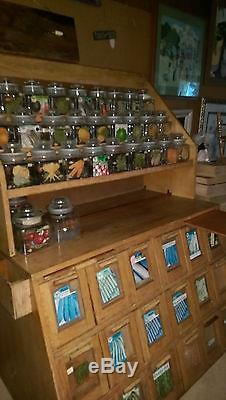 The top has three shelves that hold the glass seed canisters. 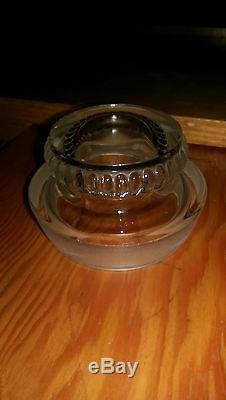 These ORIGINAL glass canisters all have hand pounded lids. It is next to impossible to find 30 canisters with these lids in this kind of condition. 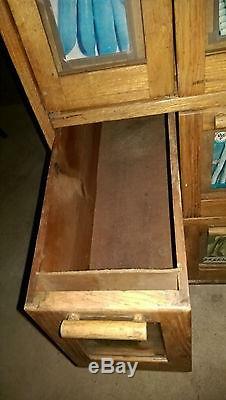 The lower cabinet comes with fourteen nicely working hopper bins that were used for seeds. The bins come with panels that fit into the inside of the glass windows to place your signage as to what is in the bin hoppers. On the inside of the glass on the hopper/drawers are still marked for a variety of seeds. Sill has the original hardware inside and out on this lovely piece of Americana! The hoppers slide in and out as they should. Thee is also two pull out wooden trays for serving convenience. This item is ready for your store or home! Thanks for looking and let me know if you need further information! The item "Antique 1920's Country Store Seed Cabinet Counter Cupboard" is in sale since Monday, May 23, 2016. This item is in the category "Antiques\Furniture\Cabinets & Cupboards\1900-1950". The seller is "countryboy1964curt" and is located in Muncy, Pennsylvania. This item can't be shipped, the buyer must pick up the item.